My husband has a thing for his Eggs Benedict. Don´t know why and I really don´t care. He loves it and he always order it when we go out for breakfast. Finally settled in Palo Alto I felt that I had to make him the breakfast he always goes for in the US. 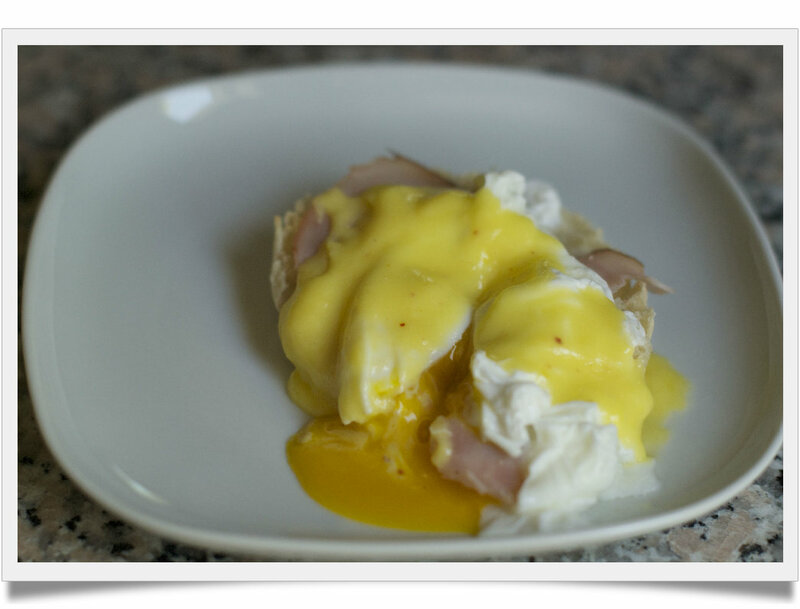 The trick in this recipe is how to succesfully make the poached eggs. 1. Add vinegar to the boiling water. Because: Adding vinegar to boiling water makes the whites firm even faster to prevent them from dispersing in the water. 2. Stir the water in order to create a swirl. Because: Stirring the water to create a swirl and then dropping the egg in the middle helps keep the egg assembled. Start with the hollandaise. Assemble egg yolks and lemon juice in a saucepan. Whisk until assembled and it starts to thickened. Slowly brig to heat and add the butter cut into dices. Be careful not to boil the sauce, this will cause the eggs to scramble. Add the cayenne pepper and set aside. Toast the english muffins and assemble it on a dish with the ham. Bring water to boil in a saucepan and add the vinegar. Crack the eggs, one at time, in a glass. Stir the boiling water into a swirl and add one egg into the swirl. Remove the saucepan from the heat and let the egg rest in the water for approximately 2 minutes. Remove the egg and assemble it on top on the english muffin. Pour some of the hollandaise on the top and serve immediately. And to be honest – I`m hooked too!